This post was revised on February 3, 2015. Cuando los hijos se van is very much a product of the time and place it was made. Released in 1941, it shows a middle-class family being torn apart by tensions between the parents and the children. In many ways it’s a steadfastly conventional melodrama from the Mexican studio era. But beyond that, it’s also a reflection of the changes that were taking place in Mexico at the time. The government was pushing the economy towards rapid industrialization, and people were abandoning their small towns and villages to go to the city. The film opens with a slow tracking shot that takes us into the home of the Rosales family, as a narrator sets the scene for us. It’s Christmas Eve. The mother, Lupita, is busy preparing the table for dinner. The father, Don José, is occupied in his study. An old friend drops by to pay a visit, laughing and joking with the family. But the festive mood is broken when a neighbor arrives unexpectedly. 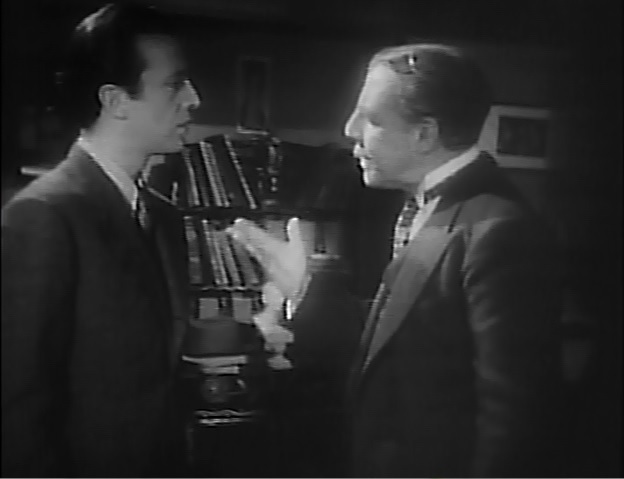 He complains that money has been stolen from his desk, and he suspects Raymundo, one of Don José’s sons. The father takes the neighbor’s accusation at face value and castigates his son mercilessly. The spirit of harmony is shattered. The Christmas celebration is poisoned. This is only the beginning. As the story progresses, the children go off one by one to follow their fortunes. José, the father’s favorite, leaves for the city to work in a bank. Amalia, the daughter, runs away to marry a man show thinks she loves. And Raymundo is kicked out of the house when his father comes to believe that he’s been having a fling with a friend’s wife. As before with the stolen money, the guilty party is actually José, but the father is adamant. He’s convinced that Raymundo has disgraced the family and insists that his son leave. Raymundo complies. The two aging parents are left on their own. And as the years go by, we watch as this frail couple is slowly overwhlemed by loneliness. This is a deeply Christian film. It opens by showing us into the family’s Christmas Eve celebration, and closes the same way. Raymundo is clearly meant to be a Christ figure. The family is broken apart by dishonesty and greed, but the members are brought together again by love and forgiveness. While the Christian symbolism is pretty heavy handed at times, the director’s passionate commitment to his faith makes the film compelling. Bustillo Oro isn’t just going through the motions to manipulate the audience. He’s making a heartfelt statement about the importance of compassion and forgiveness. The director uses a clear formal framework to tell the story. Each section opens with a shot of the front of the house, and then the camera tracks slowly inside. Each of these shots is accompanied by voiceover narration. The narrator comments on the family and the changes that have taken place as the years pass. As traditional as the film is in some ways, this device gives it an interesting, modern edge. I have no idea if Bustillo Oro was into Brecht, but the stylized camerawork and the narrator’s commentary make us very aware that we’re spectators watching a story unfold, and that the events we’re witnessing are part of a larger design. The repeated use of symbols also gives the film an interesting symmetry. The dinner table, the flowers in the courtyard, and most importantly the star on the Christmas tree are all recurring motifs. Bustillo Oro presents these symbols in a straightforward manner, laying his cards right on the table. You could accuse him of being obvious, but you could also say he’s just being honest. The camerawork is simple and fluid, with the director often allowing the scenes to play out in long, uninterrupted takes. The results of this approach are mixed. When the dialogue is sharp and the actors are strong, it works well and the film has emotional impact. But when the dialogue becomes tedious, when tiresome comic scenes drag on, the film seems to stop dead. Over all I’d say the first third and last third are strong, but the middle could be a lot tighter. The scene where Lupita listens to her long lost son perform a Mother’s Day song over the radio is especially hard to handle. It seems to drag on interminably, and the maudlin sentimentality is oppressive. Sara García, who plays the mother, is fine, but she doesn’t deliver any more than you’d expect. Fernando Soler, on the other hand, plays the father beautifully. This is a man who loves his wife and his children deeply, but he’s so bound by the conventions of his time that he can’t see beyond them. He believes that in kicking Raymundo out of the house he’s doing the only thing he can do, but we can also see that it pains him deeply. His transformation from the confident head of the family to the lonely old man, abandoned by his children is heartbreaking. As Raymundo, Emilio Tuero gives a first-rate performance. His love for his parents is palpable, and when his father condemns him it’s obvious that Raymundo is more hurt than angry. It’s not easy to play a part like this, the devoted son who makes the ultimate sacrifice for his family, but Tuero pulls it off nicely, making his devotion to his family believable without getting maudlin. Some people won’t have patience for this film, and I can’t say I blame them. No question it’s really sentimental. In many ways Bustillo Oro’s approach reminds me of Leo McCarey. And just like McCarey, the thing that makes it work is that the director believes in what he’s doing wholeheartedly. This is not someone trying to wring tears from the audience to make a buck. I don’t doubt Bustillo Oro’s sincerity for a minute. This is a deeply Christian man, who believes that compassion and forgiveness can heal any wound, no matter how deep. When Amalia places the star on the Christmas tree at the end, it’s a simple but sincere way of saying that love conquers all.